My cedar Bronze has non-locking Sperzels, so it won't fit in a Bullwinkle. I'd really like to be able to hang it on a wall and not have to use a floor stand or its case. Is there some other way to hang a Fly in your standard wall hanger (String Swing), or perhaps some way to mod the wall hanger? I realize I could throw some locking Sperzels onto this guitar, but 1) I'd like to leave it all stock, 2) I like the black/gold color scheme of the non-locking tuners, 3) the .053 low E in the standard set I use of Elixir 12's won't fit in a locking Sperzel, and 4) I have lots of experience with locking Sperzels and don't see any great benefit to them unless you have a tremolo or expect to change strings a lot, both of which I don't. 2006 Fly Bronze Cedar #51, 3lbs. 5.9oz. So which of the bronzes do you like better, and why? 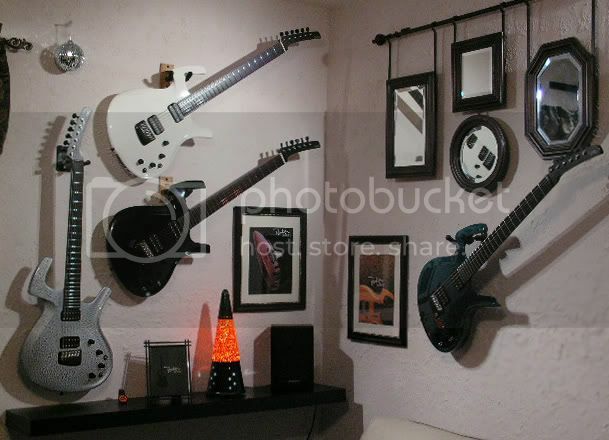 The way I have things arranged, having a guitar out for play means hanging it in a String Swing. Around here, floor stands are more accident prone. I don't think the Bronze is going to see much case time because I'm currently planning to sell all but it. I'm a bass player and having more than one guitar is just annoying. Your standard Bullwinkle bothers me because it allows the guitar to rock back and forth a lot more than regular guitars do in the wall hanger, so I'm hoping there's some better solution for Flys in general. I'm almost certain to keep the cedar, but I'm waiting on a shipment of strings to do the final a/b test. I'll post in the custom forum once I'm done. I was a little unsure of it after seeing another forum member's Fly with the upper horn broken off. Subsequently there was some discussion about it being a little unsafe. I was fortunate enough to have a conversation with Ken himself and I asked about this. He said the way I was hanging it was the way it was meant to be hung originally and it is totally safe. The Bullwinkle was a corporate demand to make the guitar easier to hang in a traditional music store setting. It is safe also but for the same reason among others it bothers me. I find that the shape of it keeps it in place more securely and I'm not a fan of the ones with the rubber washers on the ends. Hope this helps & congrats on the Bronze score on the forum. I was also interested in it. I have been wanting one myself for a while now. Thanks Simon I love them all but unfortunately a few (maybe 3!) may go. I'm needing to pull together some cash to fix a problem. I'm hoping the saying "Good fences (or at least TALL ones) make good neighbors"!! NEVER the Supreme or RP though, they are my favorite. Glad I could help Jimmy. Like I said, I've been hang my Flys like this for more then a few years now and not only do they look cool but I've never had and problems. I have seen other forum members pic. of their Flys like this also. Maybe they could chime in and provide the names of the hangers (or pics.) they use. Re: Bullwinkle for non-locking Sperzels? What stops the guitar from swinging round and dropping off? I like this solution but wonder if it would work with a standard swing string type. Wow, 5 year old thread! 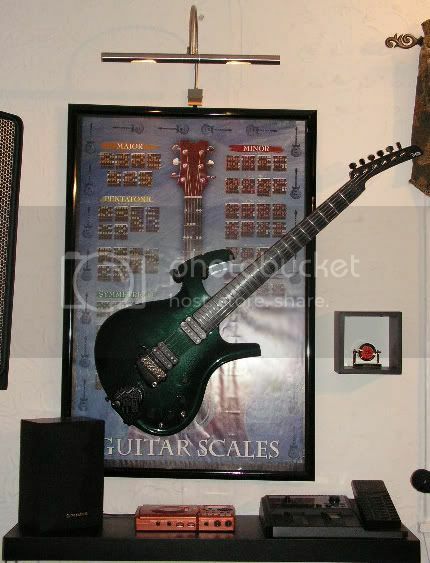 That being said, in response to Dweezil, I have hung every Parker I've ever owned like this. Flys and niteflys, all on String Swing brand hangers that I got off the shelf at a Guitar Center. If you take your thumb and pointer finger and cradle the top horn of a fly (just like the shape of a hanger), you'll see why it works. 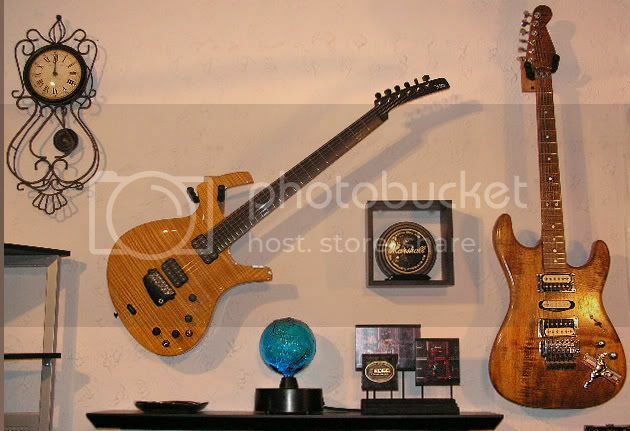 The guitar balances PERFECTLY at the angle shown in the pictures. The arms of string Swing hangers are adjustable, and can be bent inward/outward to perfectly match the size of a guitar's headstock or, in this case, the size of a Fly's upper horn. The rubber grommets on the arms hold the guitar VERY securely.